I know I promised recipes, I had no idea how hard that promise was going to be to keep (guess I need to remind myself of that sidebar BWO! :) The following are recipes that we use on a regular basis, and are scheduled within my Lenten menu. I have not included every recipe, such as a recipe for lentils and rice. Some are my own, some are from fellow bloggers and other resources. I have tried to give credit to each. As to the organization, I have a 3 ring fasting binder. The first page of that binder contains my menu, followed by a set of tabs labelled with the days of the week. I file the recipes for each day behind the appropriate tab, and store extra recipes in the back. 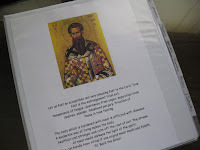 When the season changes, the recipes will go back into my Triodion binder for the next year. So, here are the recipes, please let me know if you find any typos, or you know the source for a recipe I have failed to credit. Most of these recipes are kid friendly, though a few are just for me for lunch some days :) And of course, there is always a lot of peanut butter and hummus served around here. Do you give up meat during Lent or is this just a preference? I am Roman Catholic and we give up meat on Fridays during Lent, that is why I ask. This is so wonderful. We are newly converting to Orthodoxy and wanting to gradually follow the fast. But I felt so much like I had no recipes to start with. Thank you many times over! Welcome Home Uncle "J" !